Jesus loved Mary, Martha, and Lazarus; yet He stayed where He was, and Lazarus died. Why would Jesus do such a thing? Jesus said that Lazarus’ sickness was “for the glory of God, so that the Son of God may be glorified through it” (John 11:4). 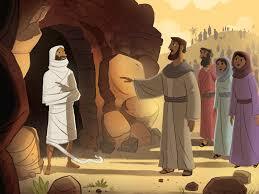 He said that He was glad He wasn’t there when Lazarus died so that the disciples may believe. (John 11:15) Jesus’ timing is always perfect, and He acts or doesn’t act so that God will be glorified.